Craig Gower is an international who has played both codes and has had a controversial career off the field. 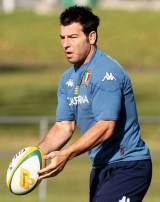 He has represented Australia at Rugby League 18 times and captained his country against the French in 2005 but after he switched to Union to play for French Top 14 side Bayonne, he declared that he was eligible to represent the Azzurri as he had an Italian Grandfather. He represented the Penrith Panthers in Australia at League and played at half-back due to his excellent kicking game. In 2003 he captained the Panthers in their shock win over the Sydney Roosters in the National Rugby League Final. In 2005 he was sacked as captain of the Panthers after an alcohol-related incident at a charity golf event. Following his switch to the 15-man-code Gower was selected by Italy for the tour of his native Australia and ironically played against the Wallabies on his debut in a 31-8 defeat at Canberra Stadium in 2009.